We previously blogged about UX pattern sites and I think Quince should be added to the list of useful sites when it comes to patterns. 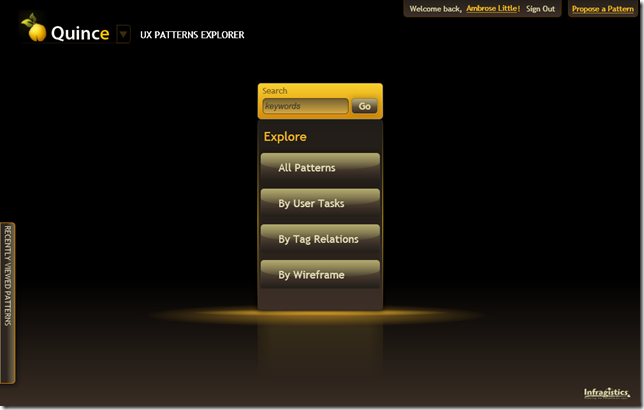 You can search for patterns by keywords, explore all patterns, by task, by tag relations, and by wireframe. Especially the last way of finding a pattern is new to me and I have found it extremely useful. While the site is not the quickest at loading I definitely think it is worth a visit! This entry was posted in Uncategorized and tagged Patterns, UX, UX Patterns by Objective Experience. Bookmark the permalink.